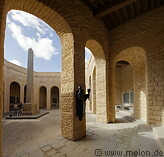 The German World War II memorial is located 10km west of El Alamein on a small hill. It has an octagonal shape, somehow modeled after Castel del Monte in Apulia and was built in 1959. The memorial has a circular inner court, which is flanked by a colonnade. At the centre of the inner court there is an obelisk made of German basalt.